A rare case in medicine: twins Luiza and Lívia Wurzius, from Cuiabá, Mato Grosso, surprised their parents and the whole medical crew. “The first one to be born was Luiza, and I immediately saw that she had Down syndrome. One minute later came Lívia, who didn’t have the syndrome. Both of them are perfect the way they are, and they complete our family,” says 36-year-old physiotherapist Raquel Cimi. Mother of small Laura – who was already three years old – she and her husband, Daniel Wurzius, wanted another baby, but weren’t expecting the present to come in a pair, and in such a special way: it’s estimated that cases such as this happen once in every million births. “The doctors told us they had never seen anything like that,” says Raquel, who got pregnant easily, without the need for any treatment. 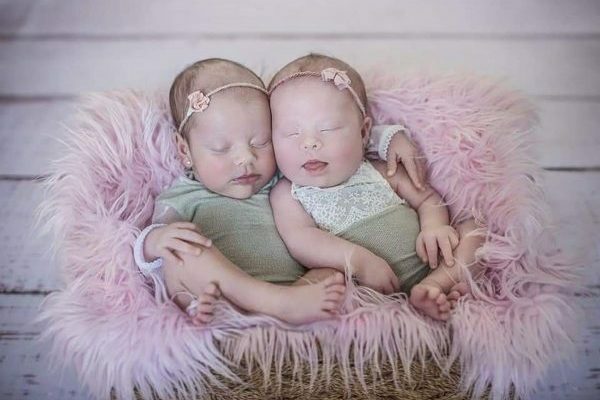 According to obstetrician Vinicius Zanlonrenzi, from Curitiba, Paraná, this is a rare situation, and happened because the girls are not identical twins, which means they were formed from two different eggs and two different placentas. “They have a different genetic material: one of them has the syndrome, and the other doesn’t,” explains the expert. If the twins were identical – a result of the fecundation of a single egg which splits and becomes two embryos – the extra chromosome which causes the Down syndrome would be present in both children. “There are also other elements we should take into account, such as the mother’s age, if the fertilization or conception was natural, or any disease the parents might have. Therefore, a case like this one in Mato Grosso is, indeed, rare,” says the expert, who acts at hospitals Santa Cruz, Nossa Senhora das Graças and Santa Brígida, at Curitiba. The news about the difference between the girls came in the third month of gestation. However, it was only possible to discover if one of them had Down syndrome at the time of birth. “Doctors saw that Luiza had size alterations, but they didn’t know which syndrome she had. Depending on the problem, she could die right after birth, because other syndromes are not compatible with life. That destroyed me,” says Raquel, who had the same exam three times, hoping it could be a mistake. Since the alterations were shown in all exams, the medical team suggested another exam, which showed the exact syndrome affecting the child. That test is called amniocentesis, and consists in removing a sample of the amniotic liquid from inside the uterus, so it can be examined in a lab and a more precise diagnosis can be given. That, however, may jeopardize the life of the child. “In the case of the twins, which had two different placentas, the space inside the uterus was even smaller, and the exam could burst the sacks and cause the abortion of both of them. It was too risky, so we decided not to do it,” says the mother. The anxiety on October 4, 2017, was immense, and Raquel believed that both her daughters would survive. “To our joy, they were born in perfect shape. Luiza had Down syndrome, which is compatible with life, and lets her have all chances of growing up well. I realized that the minute I saw her almond-shaped eyes, and her tongue sticking out,” tells the mother, relieved. Her sister, Livia, was born a minute later, without the syndrome, and none of the girls had to go through any emergency surgery. “They went straight to my room. They didn’t need to receive any oxygen or remain in the incubator. When they gave me my daughters so I could breastfeed them, they suckled. They were healthy,” said the mother, emotional. The family also had to change their eating habits, because the twins developed lactose intolerance, and Luiza is also allergic to milk protein. “It’s not easy, so I have a nanny who helps me out throughout the day, and I can also rely on my husband after he comes back from work. He bottle-feeds them, wakes up during the night to take care of the girls, he is a super daddy,” Raquel guarantees. According to her, her daughter, Livia, is already walking, running, and saying several words, while her other daughter, Luiza – who has Down syndrome – is about to crawl. “Laura, the elder sister, loves both her little sisters, and even help me to take care of them. I am very happy for the family I have,” she celebrates.